My grandfather (on my father's side) Albert James Newnham (1881 - 19??) was a despatch clerk in South London for many years till he moved with his firm (Vollers?) to Portsmouth maybe just after the turn of the century. Later, retired through ill health, he continued his hobbies of coin collecting, medal roll research and family tree searching making these into a reasonable business sideline. My memories are of a jovial, happy fellow, usually found crouched over an old full size office typewriter, typing out copies (using carbon paper) of whatever was his latest research project. He had an amazing memory for useful facts, dates etc. Although not technically minded, he was intriqued by all modern inventions and developments and always insisted on being told in detail about all the marvellous things which he had seen arrive in his lifetime. Electricity, radio, telephone, records, films, motor cars, television etc. had all been introduced during his lifetime - an amazing time to live through (for those who did actually survive those years of terrible world wars and totally inadequate medical services). Anyhow I still have my grandfather's research work on our branch of the Newnham family - on these pages I have reproduced it just as he did over fifty years ago (I have added later information where I can find it - I am not so skilled in family searches!). This page contains various notes of Newnham's in the Isle of Wight area - my actual family origins are on another page. 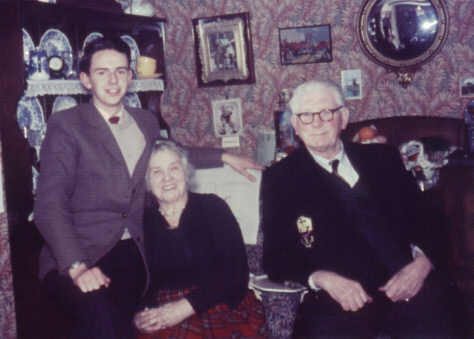 A photo, taken in 1962, of myself, aged about 16, my grandmother Florence Mabel Newnham and my grandfather Albert James Newnham, aged 81, who compiled most of this information. Collected from divers sources over a large number of years and from which almost every Newnham in Portsmouth can trace his or her descent (at least as a start). In forming your pedigree it is best to follow a retrograde course, working assiduously until your goal is reached. You won't get any further than the 17th century, lucky if you get even there. Those who boast as having come over with the "Conqueror" cannot prove their claim (the fingers of one hand would cover genuine cases); and many pedigrees are bogus for the sake of being able to "bear arms". The Newnham family are entitled to bear family arms, they exist in Kent, Sussex, Northants, Gloucestershire, Hampshire and the Isle of Wight. The latter with Sussex are the most prolific with the name and many Portsmouth families emerge therefrom. The NEWNHAM's of the Isle of Wight were undoubtedly of importance at one time as witness the papers anent the Island now in the Bodleian Library, Oxford and which are worth studying. They were considerably strong in shipbuilding and were really the "builders" of Cowes during it's development. They were employed by the government as to wrecks and owned rnany vessels. One NEWNHAM grew r!ch and was one of the first to obtain permission to build on the waste land west of the. castle there. His son succeeded him in the business which extended to other parts of the Island. The Lord Mayor of London 1787 was of the third generation, he was Nathaniel NEWNHAM and much can be read of him as to his work in that city and various positions held. The state papers give much information on the NEWNHAMs and. these papers may be consulted at the British Museum, there are also a lot in M.S. at the Bodleian, Oxford. Worley's Isle of Wight dated 1781 says:- "Manors and their possessors from the conquest down to 1781 were:- Forde; DeMolandine; Beauchamps; NEWNHAM; and now (1781) Worsley of Gatcombe." Whitwell:- Fitzstur ; Lisle; Bremshot; Po1e. Newnham:- Now (l781 ) Worsley of Appeldurcombe. White's Gazetteer 1878 says:- The Abbey of Quarr built on the Manor of NEWNHAM 129l on abbey lands. No land at Quarr mentioned, whilst land at NEWNHAM heads the list of the Abbey's possessions in the Isle of Wight. The manor therefore belonged probably to the Abbey since 1151, it's foundation. The site of the abbey and grange of NEWNHAM leased in l537 for 21 years to John Mill of Southampton. Manor of NEWNHAM in 1878 belonged to John.E. Flerning. The northern part of the manor of Quarr sold in 1858 to Admiral Sir. T. Cochrane; sold again in 1907 to the Benedictines community from Solesmes. NEWNHAM farm is 17th century but added to in the 18th. Initialled dates in the brickwork over the east door refer to the family of Young the then tenants in 1774. Hants Field Club gives:- Northe Stonmer (North Stoneham) 15 July Edward VI (1551) "Re the bells hanging, and selling of pyxes of silver to Sir Thomas NEWNHAM per me-- Thomas NEWENHAM & others (Churchwardens). Re Whitwell:- The NEWNHAM's; NEWMAN's; or NEWNUM's etc. etc. though owning large and valuable properties in the neighbourhood have not left any mementoes of their residence here. The earliest name in the burial registers is that of Elizabeth wife of Thomas NEWNHAM probably owner of Whitwell estates at that time. The earliest reference occurs in tho Archidiaconal visitation held March 1543. R.. Newnam (NEWNHAM) capella Whitwell. A badly written note by the side of the name refers to a grant for repairs. He was a churchwarden for that year. Two years later Richard and Thomas NEWNHAM appear as parishioners in the Subsidy roll 36 Henry VIII (1545). In 1545 Richard NEWNAM holds office as churchwarden. Two of their descendants Nicholas and William are entered in the "Noate of freeholders" given by Worsley's history page 109, of those who held of His Majesty's Castle of Carisbrooke in 1606. Thomas NEWNHAM's name appears in the Knighten court for 1625. In l627 Nicholas Numen (NEWNHAM) of Nyghton had to provide a light horse for Island defence. Rectors of old chureb St Lawrence at Ventnor:- This incumbent was one of the eight Isle of Wight clergy removed at the time in consequence of the action taken by Parliament and was superseded by NEWNHAM whose name is mentioned in Ca1amy's memioria1. Reprisals followed and the intruding clergy were driven from their cures. NEWNHAM of St Lawrence, though deprived of that benefice was not silenced but continued to preach in various places, particular1y at the church in his charge at Road Bridge and Stroud Green between Chale and Sherwell. On Sunday 4th November 1688 an outdoor service was being held, and upon hearing that the Dutch armament conveying Wi11iam of Orange was sai1ing past the Island, he set aside the subject he intended to have discoursed upon and gave his people a talk suited to such an event of providence. Thomas NEWNHAM minister of St Lawrence son of Thomas, was born at Gotten, Chale in 1631, an ancient seat belonging to his family. His education in the island was first at Kingston school and afterwards at the Free school at Newport where he made proficiency in grammar with a brother of his who was designed for the university and later went to Oxford where he took his degree in 1658. He and Dr Pettis returned from Oxford to the island and were ordained together by presbyters in Newport church. Thomas NEWNHAM was ejected from his living in 1662 for non-conformity. Parishioners shewed a marked respect for him by carrying in their corn before Bartholomew day on purpose that he might have the tithe of it. After his ejectment he sometimes went to Whitwell church to hear Mr Harrison. One Lord's day, Mr Harrison not arriving, the people desired Mr NEWNHAM to officiate and he complied and preached from the seat in which he was sitting. He made much trouble on account of his non-conformity and was fined etc, but bore all with invincible patience, courage, and constancy of mind. He died of smallpox at Whitwell and was interred there in 1689 in the 58th year of his age. On his deathbed his faith was strong and his resignation to the will of his Heavenly Father was remarkable. His father survived him, and by a partition deed is shown to have left severval grand-children to inherit. A grandchild, son of the minister, attained his majority in 1704. The deed (original in Dr Whitehead's hands), is very lengthy, it deals with the family estates in Niton, Whitwell and Chale, and from it the following is deduced:- dated September 1689;- Thomas NEWNHAM the elder married Elizabeth ???? of Whitwell and Gotten - living at 1689, buried at Whitwell, brother un-named;- Thomas the cleric, born 1651, died 1689 aged 58, John of Whitwell and Gotten had bequest of £100, Mary ???? an annuity of £15. Thomas, son of the cleric and grandson and heir of Thomas NEWNHAM senior. Ann, grand-daughter of Thomas NEWNHAM senior had a bequest of £200. Thomas NEWNHAM Junior executed the deed dated November 1704 for re-selling estates and raised by mortgage the sum of £600 for this purpose. Excerpts and visitation Nich Harpisfeld Commissario XIII September 1527 page 159 at Newport, relates to the will of Richard NEWNHAM (spelt Newnam) sometime at Whitwell, and mentions Johanne NEWNAM relict and executor of the will. In the list of churchwardens in visitation books is - 1532 Thomas NEWNAM with John NEWNAM as a parishioner at the vestry; 1609 Nicholas NEWNAM - warden. In the list of clerics Whitwell is - 1574 Richard NEWENHAM curate, also 1582. At Southampton Tudor House Museum a bond is displayed of John NEWNAM of Whitwell, Isle of Wight, dated July 1560, in sum £40, present day a very large sum - for his good behaviour in matters of religion. Niton:- William NEWNHAM held big estates in Whitwell and Chale (see Subsidy Roll 1642). In June 1659 the marriage of William NEWNHAM of Chale and Ann Pittis of Niton is recorded. William NEWNHAM by copy dated 1605, a cottage etc. late Valentine Cole's viz:- barn of two bays, appleyard and curtilage 1/2 rood. A close near le Cote 1 1/2 acres. Close called Berryes 2 roods. Arable in le Westfield 2 roods. Common for 25 sheep, for his life. Value to lease 26 shillings 8 pence. Rent 5 shillings - 1 work herriott. My grandfather compiled searches of Isle of Wight church records for NEWNHAM's and near derivatives, for births and deaths for 1600's up to the 1800's. (Later information is more easily available from official sources). If any NEWNHAM's etc. are researching family history in the Isle of Wight I will be happy to provide photocopies of his work - (probably about 50 A4 pages, amateur typed! ), for a small fee to cover photocopies and postage.